As we travel, we get to see mountains. Impressive mountains. 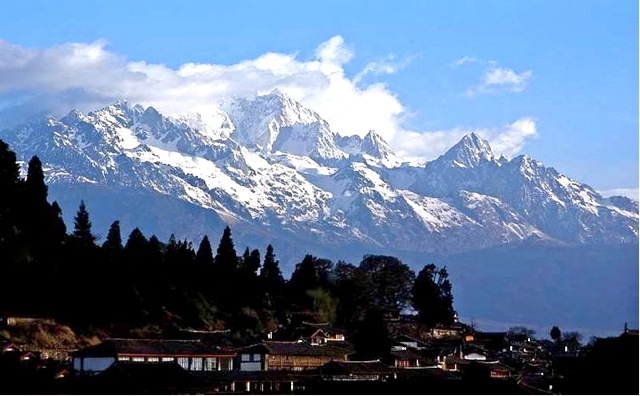 This beautiful snow capped mountain is the Jade Dragon Snow Mountain (玉龙雪山) near the medieval town of LiJiang (丽江). While LiJiang itself is a picturesque town with 800 year old houses where the nationality (ethnic group) of NaXi live, the mountain looms in the distance and forms a rugged backdrop. 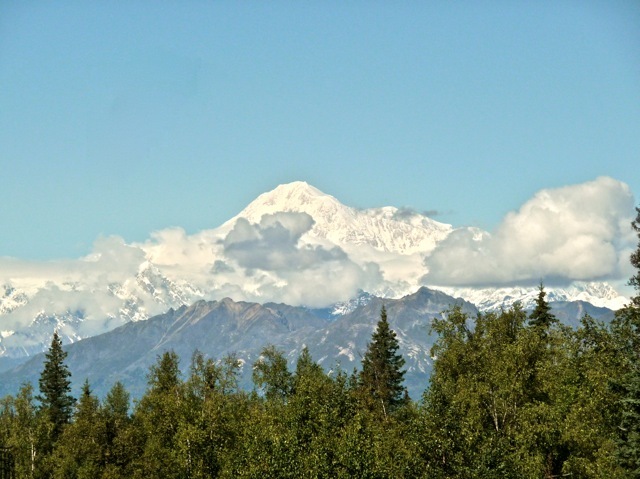 The highest peak in North America is Mount Denali (Mount McKinley) in Alaska. Surrounded by a vast national park bearing its name, the peak often hides behind clouds. When it occasionally becomes visible, its snow cap pokes above clouds. 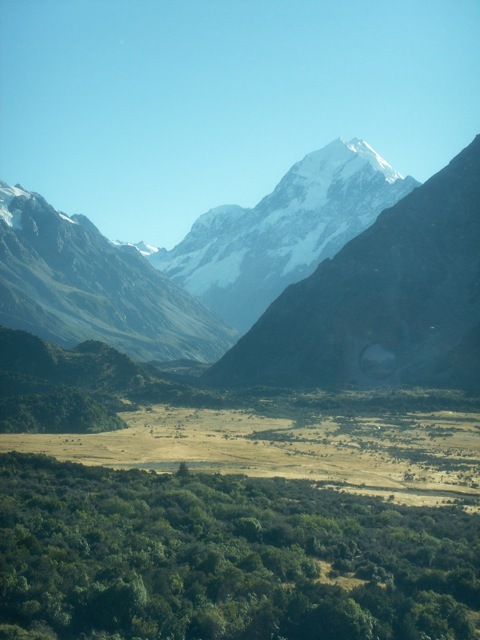 The highest mountain in the beautiful land of New Zealand is Mount Cook. While the mountain is monumental, the land leading to the mountain is just as spectacular. The wide valley floor dwarfs trees and the occasional car. The glacial runoff from Mount Cook is so laden with silt and gravel the water appears grey. On the high Tibetan plateau, snow capped mountains look like low hills. As I suffered severe altitude sickness when our bus climbed the highest point of the highway at 3.2 miles high, I did not visit the Himalaya Mountains. Otherwise I would have seen even more impressive snow capped mountains. 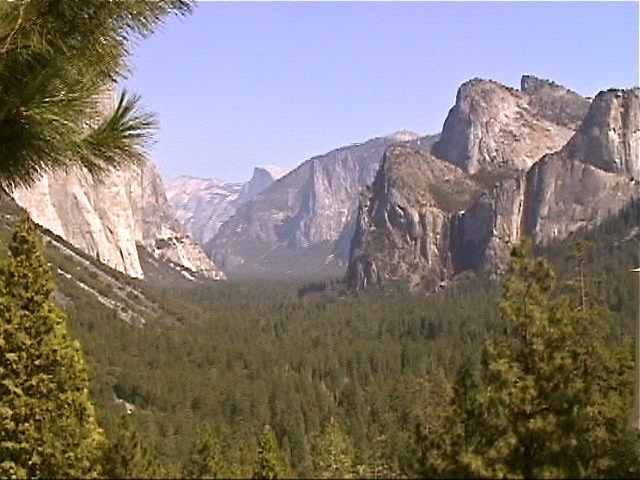 One of the most beautiful mountain we have seen is the Yosemite Valley. The ancient glaciers shaved off halves of rocky peaks and left sheer cliffs and hanging water falls. 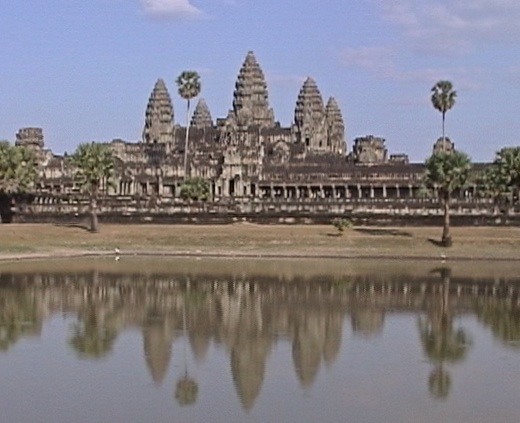 The main temple of Angkor Wat in Cambodia is a breathtaking rendition of the Hindu sacred Mount Meru, home of the gods. According to Hindu myths, it is 600,000 miles high, making it the highest mountain on mythical Earth. This UNESCO site should be on everybody’s bucket list. Almost every square inch of the stone buildings is wonderfully covered by skillfully carved figures and decorations. In the real world, the tallest mountain is Hawaii’s Mauna Kea. This live volcano rises 33,000 feet straight from the ocean floor, taller than any other on Earth. But it is only 13,800 feet above sea level, allowing Mount Everest at 29,000 feet to be recognized as the highest mountain on Earth. 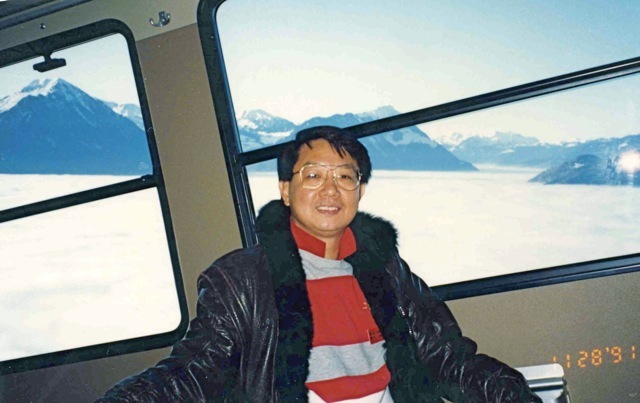 Sally and I ascended the “top of Europe” at Jungfrau (少女峰) in Switzerland. The cog wheel train climbed the peak at 25% slope at times. To ride in a train high above the clouds is an experience found only in dreams. 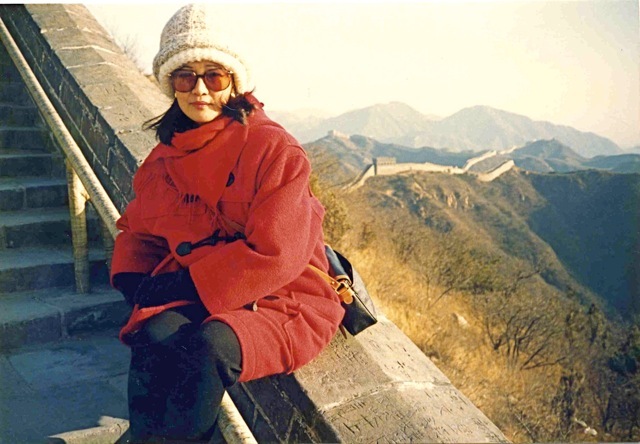 The Great Wall of China was built in mountainous regions, in places. It is a challege to walk on the Wall as it climbs up and down hills. It must have been a nightmare for workers to build the Wall. 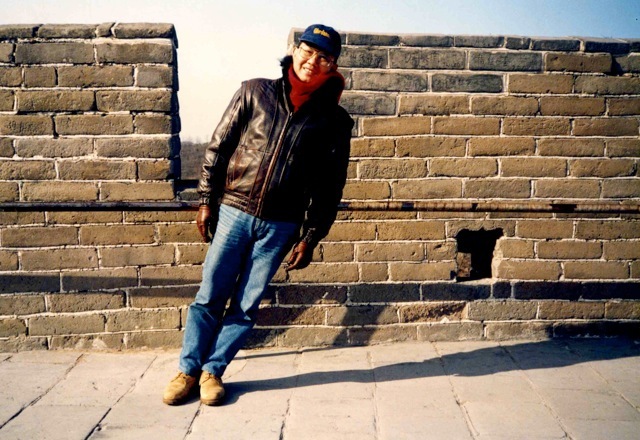 Here, I stood erect on a steeply inclined walkway on the Wall. Other mountains are famous for historical or scenic reasons. TaiShan (泰山) has always been recognized as a sacred mountain in China and emperors climbed it to make offerings to legitimize their mandate. This stairway up the side of the mountain is a vigorous climb, and most tourists take the aerial tram to the top nowadays. TaiShan only has mediocre sceneries, but its sunrise is credited as the first ray in China proper. 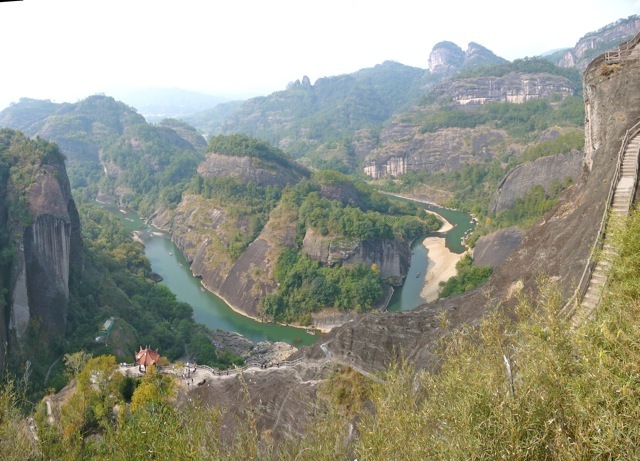 WuYi Mountain (武夷山) is an UNESCO site. But I found it to be less spectacular than I was led to expect. 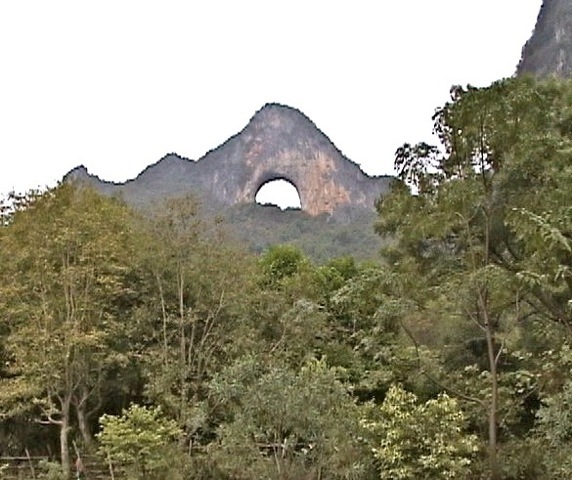 When we visited YangShuo (阳朔), we found the Moon Hill (月亮山) with a hole under the hill top arch. We climbed the hill and viewed the picturesque karst peaks, paddies, rivers and village houses below. 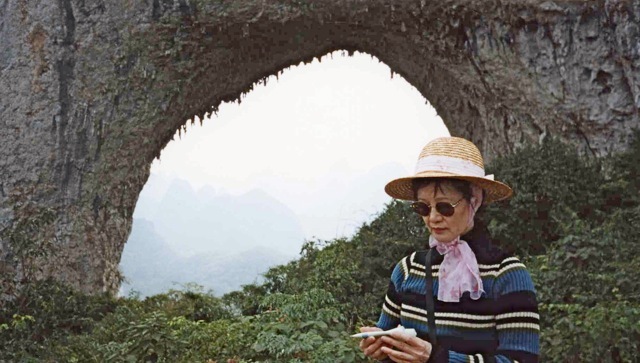 Our favorite inn in all of China is the YangShuo Mountain Retreat by the Dragon River. 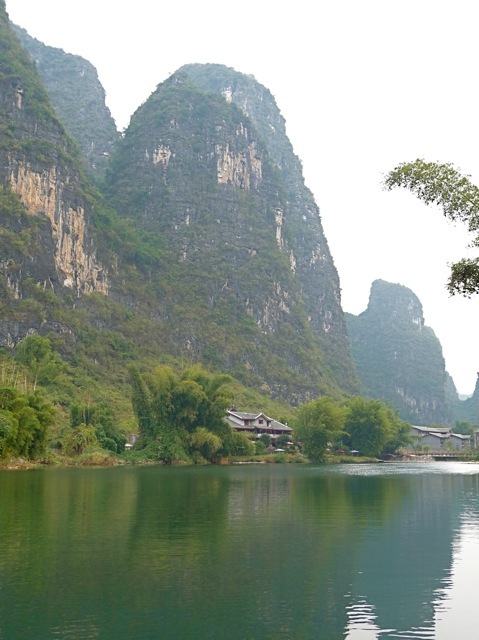 The remoteness, classical Guilin sceneries, karst peaks, and the flowing water make this an ideal place to retreat for a week. 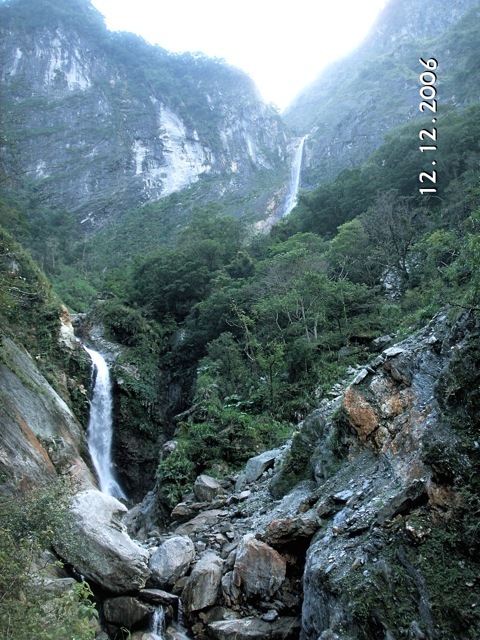 The Taroko Gorge of Taiwan is in an earthquake zone and landslides are frequent. The unstable ground produces a rough and beautiful landscape, if somewhat scary. 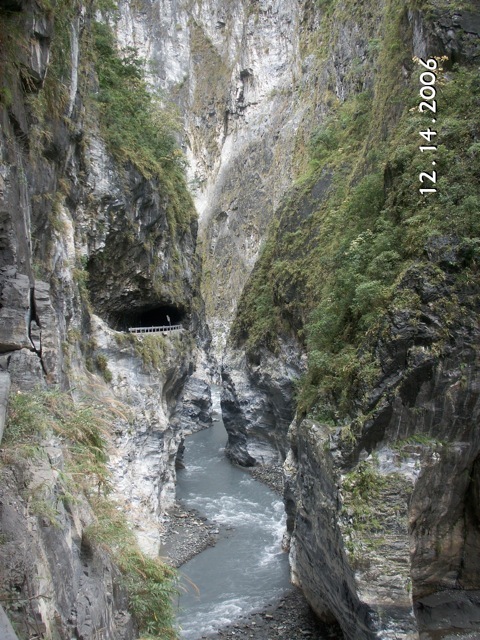 The highway cuts through the rocks of Taroko Gorge with only a few feet of space in between walls. 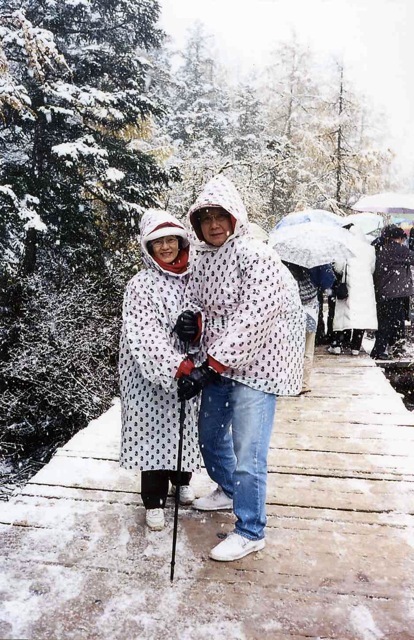 When we visited JiuZhaiGuo (九寨沟) in late autumn, we climbed the mountainside of HuangLong (黄龙) to view the calcified pools and water falls. 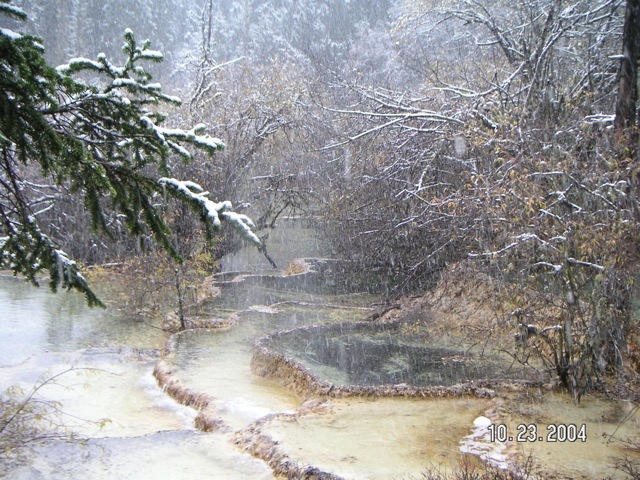 We were caught in a sudden snow storm and were gifted with this photo of a perfect winter wonderland. My sneakers’ soles were very slippery on snow covered wooden planks. We risked broken bones and gingerly walked down the mountainside. 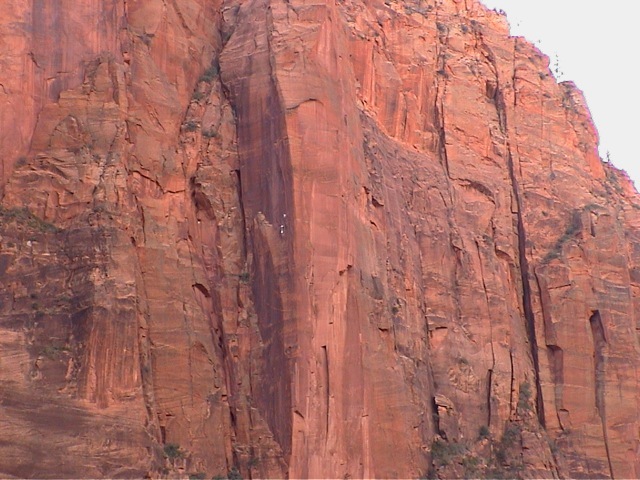 When we visited the Zion National Park in the US, we saw three rock climbers hanging onto the side of a sheer cliff. It took them three days to complete the climb, obliging them to sleep hanging on the cliffside. The mountain showed us its angry side. 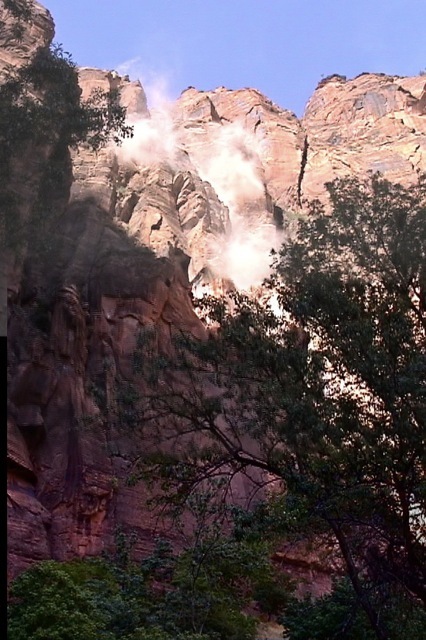 This cliff of Zion National Park had a thunderous landslide, stirring up dust clouds. The fallen rocks are eventually carried away by the river at the bottom and the canyon expands and grows. 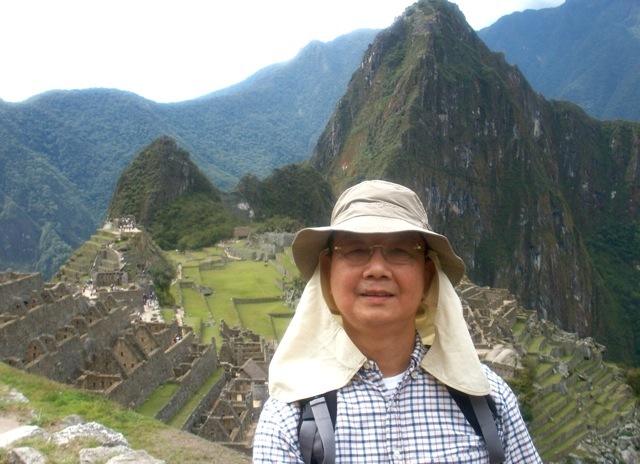 One of the most memorable mountain trips was to Machu Picchu in Peru. True to its reputation, the massive stone buildings perched on a lonely peak evokes the strongest sense of wonder. 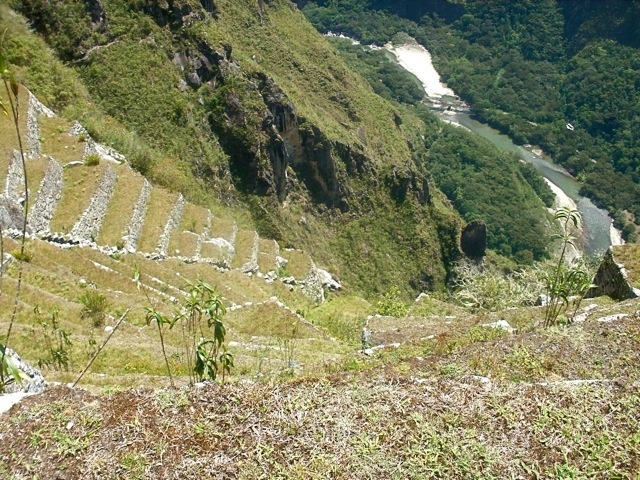 How much man power and time were spent to build this city and why did the Incas build this city in the clouds? Some mountains in China deserve their reputation for awe-inspiring sceneries. 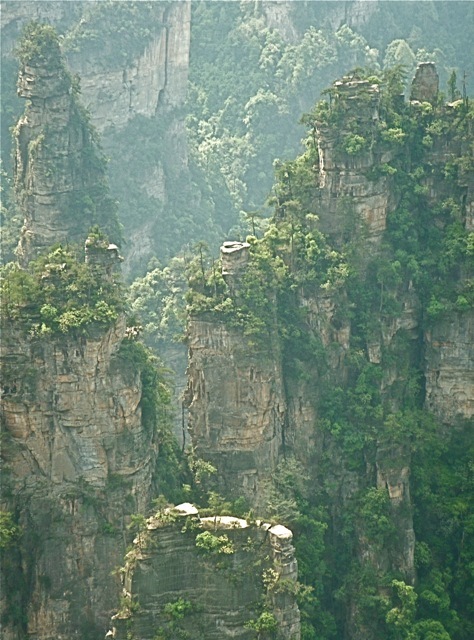 ZhangJiaJie (张家界) inspired the dream-like sceneries of the movie Avatar. 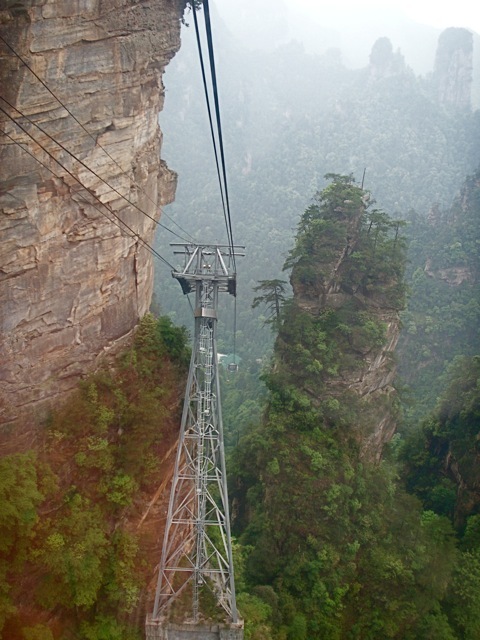 To reach the mountain tops, a long aerial tram takes the tourist through slender pillars of rocks. We felt like the creatures flying through floating mountains in the movie Avatar. 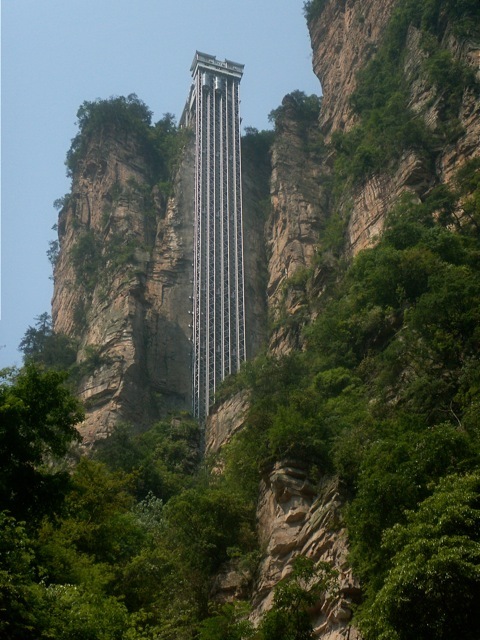 A tall elevator takes tourists to the top of the mountains. Incensed by this elevator intruding on the pristine state, UNESCO threatened to withdraw its designation as a World Heritage site. The slender pillars are composed of horizontal layers of rocks. 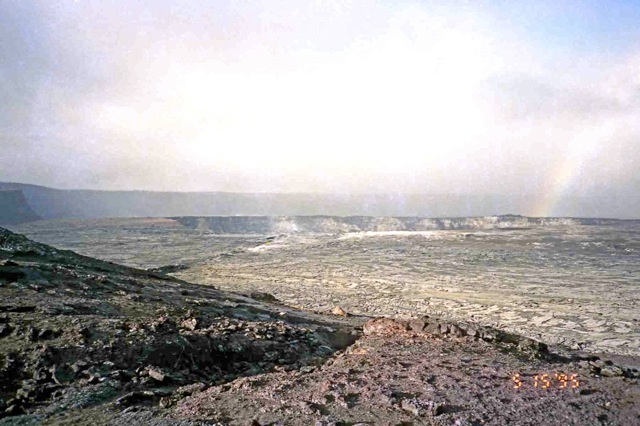 The eroded flat tops reflect sun light and form shiny oval mirrors. 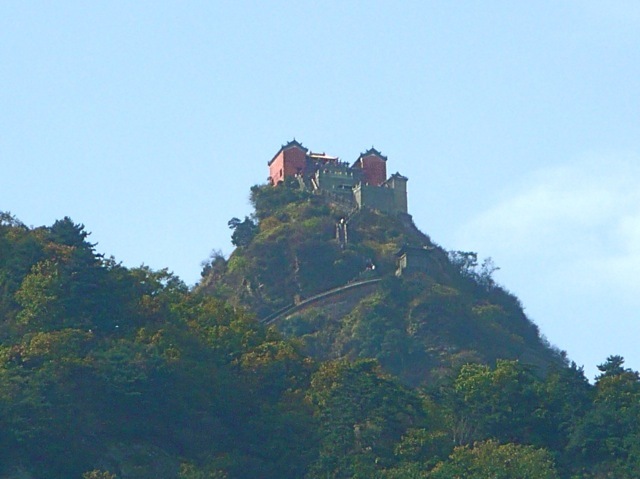 WuDang Mountain (武当山) is the sacred mountain of Taoism (道教). Many elaborate Taoist temples were built under the Ming emperor’s patronage at great expense. The Golden Hall (金殿) is a bronze building carried up and assembled on the peak of WuDang Mountain. 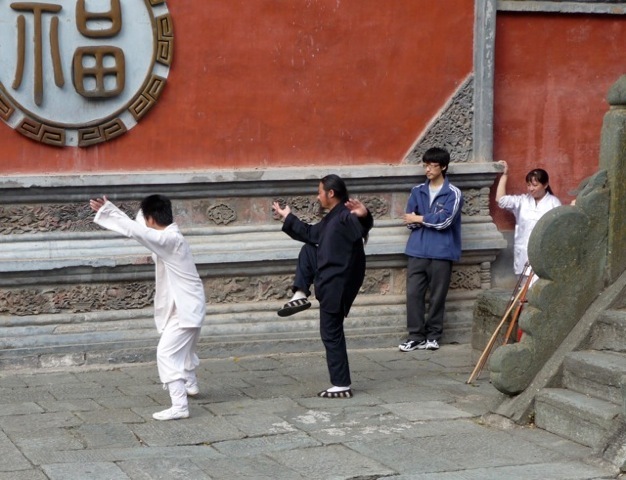 WuDang Mountain is the fountainhead of taichi (太极拳) martial arts, just as Shaolin temple (少林寺) is the fountainhead of the “hard” school of kungfu. Here, a Taoist monk master teaches his students. Another mountain I recommend it HunagShan (黄山). Its sea of clouds, HunagShan pines, precipitous peaks, and ever changing sceneries make it the inspiration of Chinese painters. 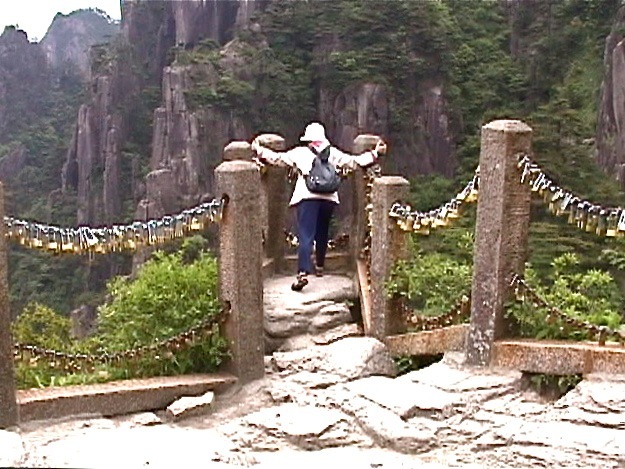 A visit to HuangShan would convince the skeptic that ethereal sceneries of Chinese paintings are real. Sally hangs on for dear life to peek over the chains into the abyss of a cliff. 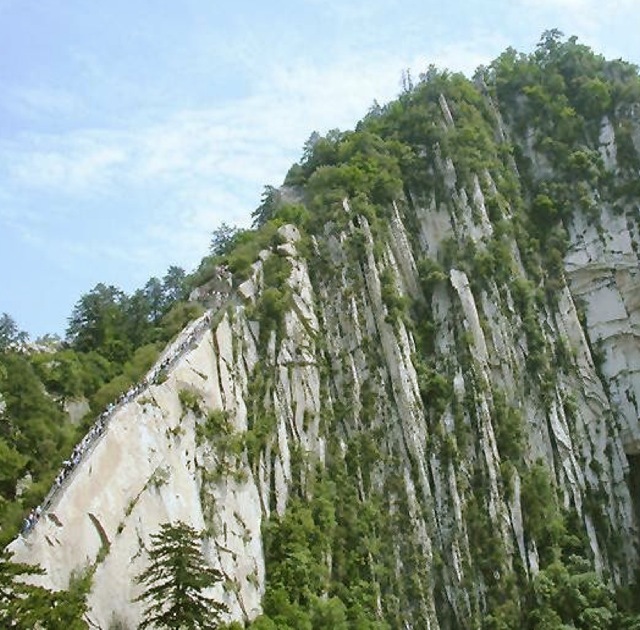 The most scary mountain, in my opinion, is HuaShan (华山). 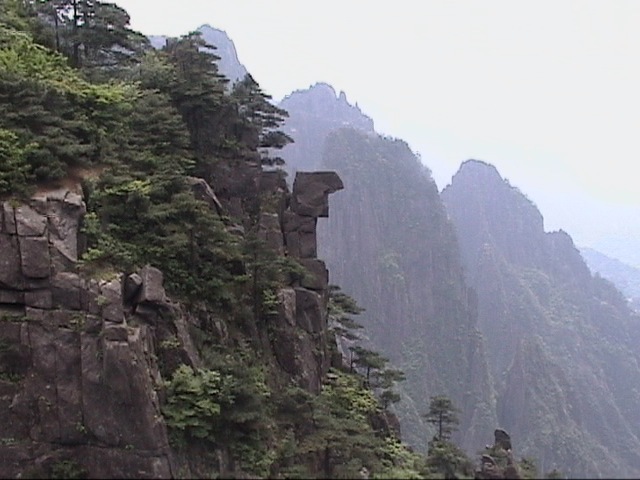 Tourists gingerly walk up the narrow Black Dragon Ridge with thousand feet drops on both sides. Legend has it one famous poet became petrified on the ridge (without chain barriers), threw away his belongings, hugged the ridge and wailed. He had to be rescued by a brave soul. When I walked the ridge, I saw the shadow of climbers on the cliff across the deep gully. 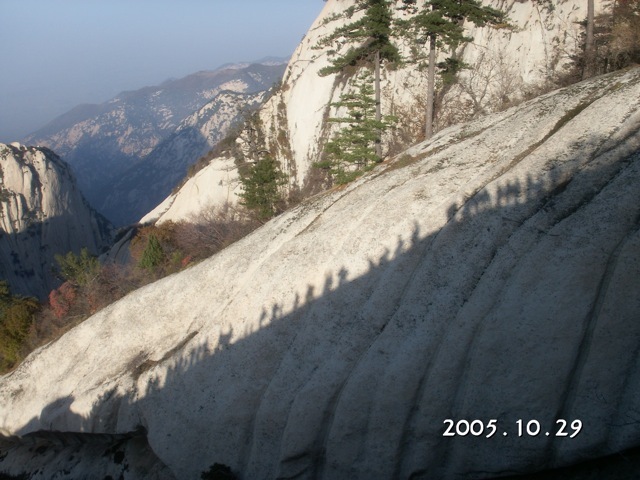 Although I did not venture to the most scary trail of HuaShan, its reputation sends chills down my spine. 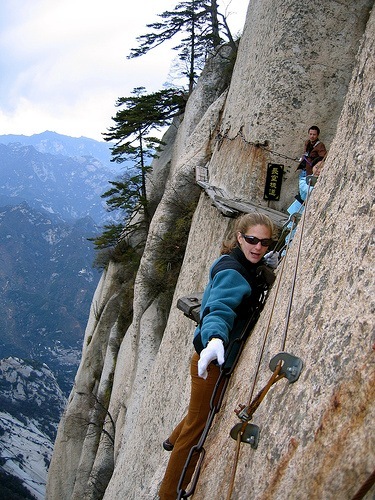 Here, tourists crawl against the cliff wall, walking on wooden planks thousands of feet above the ground below. To keep tourist deaths to a minimum, tourists wear harnesses nowadays and hook onto the cable at waist level. 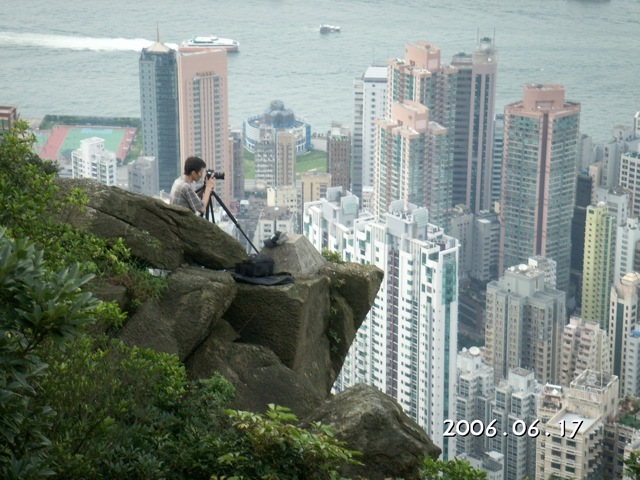 My most favorite mountain is the Victoria Peak of Hong Kong. Two thousand feet above the concrete jungle, the view from the peak is stunning in all times of the day. 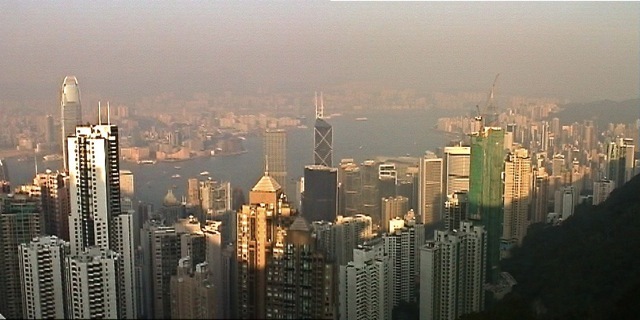 The ever rising sky scrapers threaten to obscure the peak from sea level, and upset Hong Kongers to no end. An intrepid photographer goes out on a limb to catch the most exciting picture of the city. 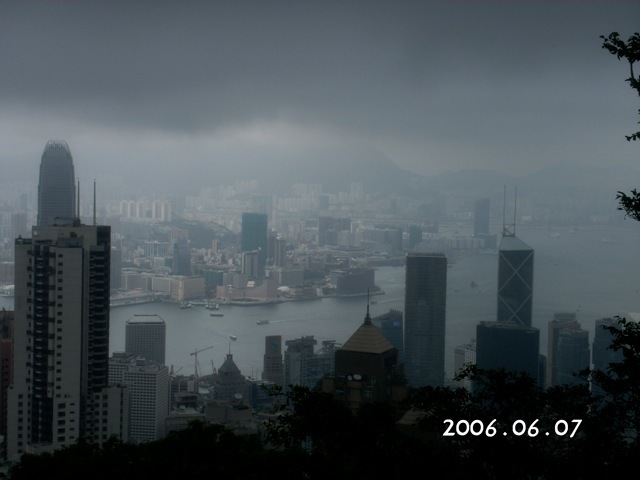 Impending doom threatens Hong Kong as a storm descends. 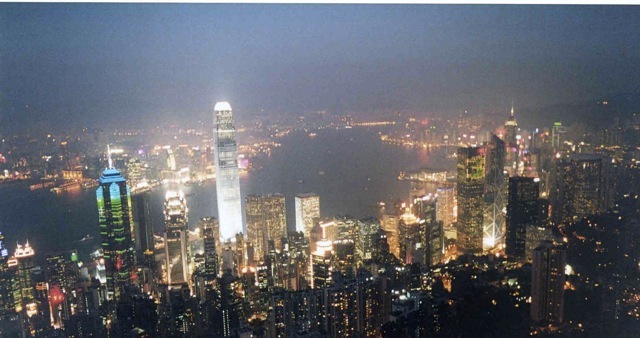 The most spectacular view of Hong Kong is at night when the multi colored lights of buildings light up the city. In my opinion, this is the most beautiful city view in the world. Posted by Robert Wu on Sunday, January 9, 2011, at 10:54 am. Filed under Uncategorized. Follow any responses to this post with its comments RSS feed. You can post a comment or trackback from your blog.